Doodlecraft: Homemade Paper Mache Clay! Versatile and easy to make anything you can think of! It's easy to make and lightweight! Take your toilet paper and put it in a large bowl. Pour 4-6 cups of warm water right over the top of it! Now it's a cinch to remove the cardboard tube. Now, pick up roll and squeeze! Ring out all the water you can possibly squeeze out. Now break the toilet paper into chunks. As small as pieces as you have the patience for! Until you have chunked it all. joint compound into your mixer bowl. It will stick and form a very fibrous paper clay! Or, start making things right away! Then covered it with paper mache clay. put them in a slightly larger bowl to dry. I let them air dry completely...a couple of days. Then I removed the plastic wrap and spray painted on bright metallic gold! I tried adding some paper doilies! I rolled out the clay into a thin sheet. then cover the ball with a piece of plastic wrap. Then remove the top layer of plastci. Press the doilies into the paper mache sheet. The moisture absorbed right into the doily...making the perfect bond! and press the clay down inside it. Trimmed around the edges and let it dry! Then I spray painted it in gold! I'm sure it would disintegrate. But it's perfect with these fake succulents and fabulous rocks! Press the stamp into the paper mache clay...and gently peel it off the stamp. I used a cookie cutter to get a nice round shape. The paper fibers make precision a little bit difficult, but no worries. I gave each pendant a quick coat of spray paint. After drying, I added daubs of color. damp cloth to blot off the excess paint. So they are subtle...nearly tie dyed. Kind of hippie feeling with the paper fibers and bright colors! I might spray on a little shiny top coat to finish them off. And mold it into the form of your desired product. since the paper mache clay will add to the bulk of it. Add a thin layer of clay onto the form. Painted yellow for the perfect touch! Make an Easter Egg tray! Then add a thin layer of clay over all of it. found a spoon worked just as well. I only did half of it...because I ran out of clay. Then I baked it in the oven at 250* for 1 hour. Then removed the foil and baked it again for about an hour. I spray painted it pink! 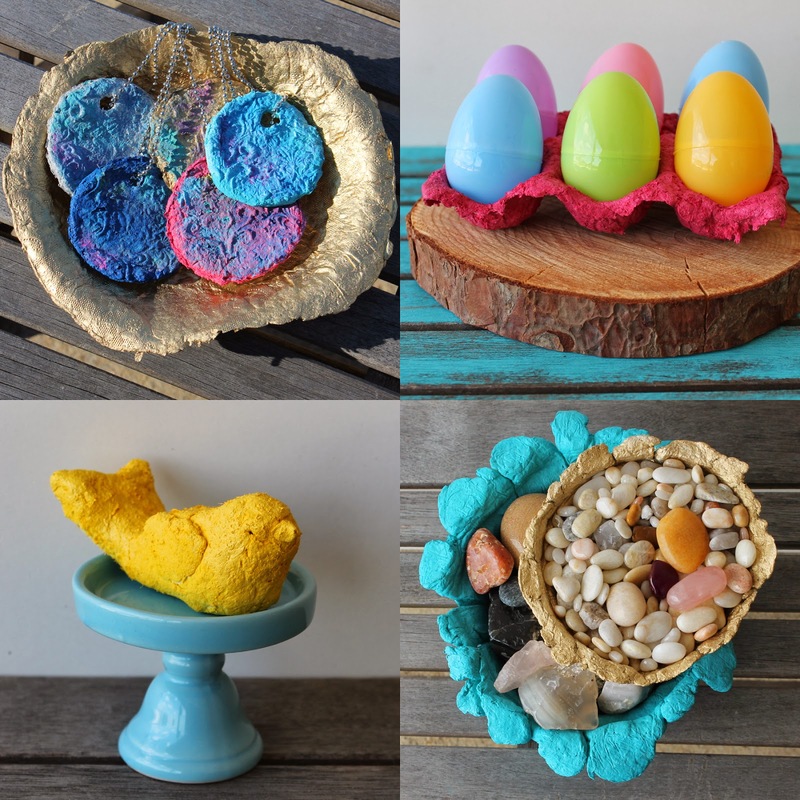 Great for Easter and decor! I love this rough paper fiber edge! Thanks for the recipe, this is the first time I used paper mache, since I in the third grade. I want to make a tree from it, wish me luck. Thanks for the recipe! Much more economical than commercial product!